Professor David Noelle, right, discusses cognitive science with student monks. 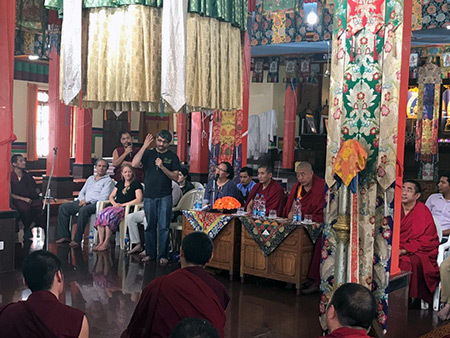 Two UC Merced cognitive scientists spent part of their summer in India this year, teaching neuroscience to a group of exiled Tibetan Buddhist monks. Professors Ramesh Balasubramaniam and David Noelle each made their second trips to southern India, where they taught at two of three monasteries that take part in the Emory-Tibet Science Initiative (ETSI), a six-year summer science program that contributes to the monks’ advanced degrees. Initiated in 1998 by the 14th Dalai Lama, the affiliation between Emory University and Drepung Loseling Monastic University has grown into a multidimensional organization that helps advance the Dalai Lama’s directive that scholarly monastics study science and promote the convergence of science and spirituality. Each year’s ETSI summer sessions offer about four weeks of courses on the philosophy of science, physics, biology and neuroscience, taught by faculty members from Emory and other universities. Students spend six hours a day in class, hearing lectures, holding discussions and debates, and participating in demonstrations and experiments. Professor Ramesh Balasubramaniam teaches a group of second-year students. In India, the monks have replicated monasteries from the home they left to escape Chinese persecution. The professors teach in pairs, but Noelle and Balasubramaniam each had other teaching partners and were assigned to different monasteries. Noelle, who taught at a different monastery in the same settlement where he taught in the summer of 2015, said it was nice to be remembered after two years, and to have a skilled group of translators to facilitate discussions of sensory systems in humans, the week’s lessons for his group of about 50 second-year students. Because the Buddhists believe consciousness is separate from the brain and that even the most basic organisms have conscious experiences — even if they don’t have brain cortices — sharing concepts about how the brain receives and interprets sensory data can be challenging. “One of the concepts that really interested my students was the complex set of processes that results in our perception,” Noelle said. The professors devise activities that can illuminate these concepts for the monks, such as having them form human chains to play a version of “telephone” to understand how sensory information is transmitted to the brain from the eyes, nose, tongue, ears or skin, and how a damaged cortex can garble that information and change perception. The monks learn through debates, and often challenge the teachers and push ideas to gain more understanding, Balasubramaniam said. The monks are open and curious, and it’s good that they are willing to do scientific experiments. The methods and findings of modern science are just beginning to influence their core commitments, however. This program is only one step in what is sure to be a long process. The Dalai Lama says Buddhism has an empirical foundation and practitioners should question everything, so the monks have a long history of considering questions about the nature of the mind, the self, and consciousness. This program gives them a way to learn about Western science and contribute to the education of their fellow monks. “They have a great respect for the scientific method and how one scientific truth leads you to another and another,” Balasubramaniam said. They are also interested in finding scientific ways to understand some of their spiritual beliefs, Noelle said, such as the idea that the “subtle mind” takes over after physical death and has activities to perform before every part of consciousness leaves the body. Rather than disturbing the process, Buddhists will sit with the dead until a sufficient time has passed, and they can begin the process of disposing of the body. “The monks are open and curious, and it’s good that they are willing to do scientific experiments. The methods and findings of modern science are just beginning to influence their core commitments, however. This program is only one step in what is sure to be a long process,” Noelle said. The monks might not be able to take many more steps, because ETSI’s funding ends after the first cohort of monks finish its sixth year.